Complete left lateral oculomotorius palsy. Paresis of the rectus extern. Cause of the affliction not entirely clear. Perhaps a malignant tumor in the region of the left cerebrum peduncle. 40 year old, previously always healthy magazine worker. Non-alcoholic. Verifiable indication of lues in the hand. Sickened with severe pain in the left occipital and ear region about 6 months before the photo session. Thereafter, gradually incremental right lateral hemiparesis, ultimately with a perfectly slack palsy in the right arm. 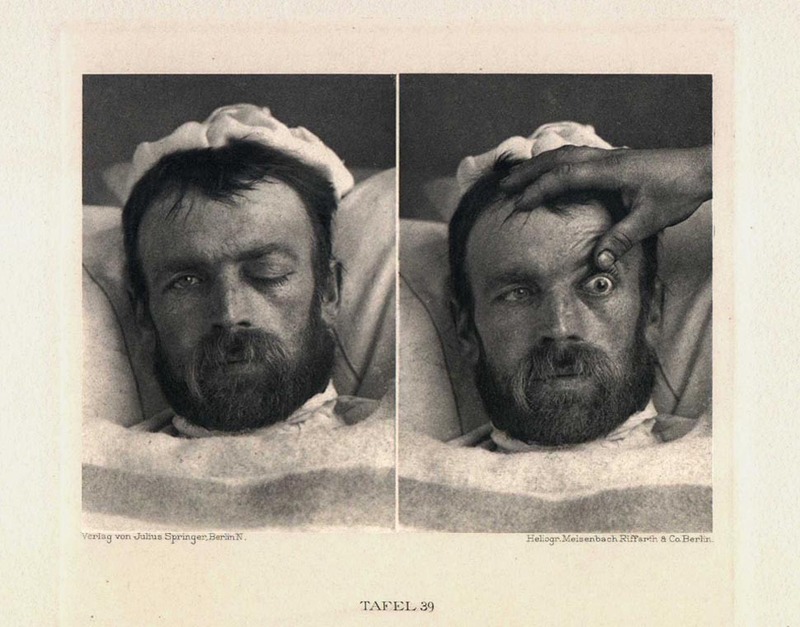 14 days before the photographing, onset and rapid cumulation of a ptosis of the left eye with incremental loss of sight, which was never quite clearly understood by the patient. By the time of photographing, a perfect left sided oculomotorius paralysis was established. The plate shows the face with upper eyelid, on the left overhanging, on the right pulled up high. The left picture allows us to recognize with remarkable clarity the prominence of the eyeball behind the slack overhanging lid (exophthalmus paralyticus). A certain rounding of the right cheek region and relaxing of the nasolabial fold indicate paresis in the lower facial zone, which indeed may be demonstrated by this patient. The right illustration shows that the staring strikingly protruding bulbus is movable, and that the quite broadened pupil is neither reflective nor accomodative. The more accurate test proved perfect paralysis of the mus. rect., super., intern., infer., and oblizuus inger., while the motion of the bulbus is restricted outwards, it is not annulled.